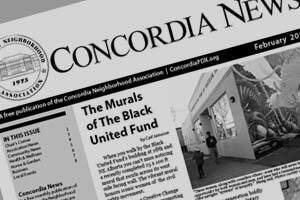 The Concordia News newspaper is a free, self-supporting, monthly publication of the Concordia Neighborhood Association produced by dedicated volunteers. 6,500 copies of The Concordia News are printed each month, with an estimated readership of 10,000. In addition to the 5,500 copies mailed to homes in the Concordia neighborhood and beyond, there is a business circulation of 1,000 copies. Advertising in Concordia News is a cost-effective and efficient way to deliver your message to the many local residents and visitors who seek to support local businesses. To advertise, please contact: Concordia News Business Manager by emailing CnewsBusiness@concordiapdx.org. Advertising rates can be downloaded by clicking here.